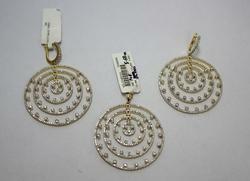 Prominent & Leading Exporter from Jaipur, we offer diamond pendant set. We are the leading manufacturer of Handmade Diamond Pendant sets in Jaipur. We also deal in customised designed Set. You can purchase a diamond necklace or a pair of diamond earrings but if you purchase a Diamond Pendant Set. Then you can get both earrings as well as a pendant. There are different types of pendant sets like three diamond pendant set, single stone pendant set etc. Diamond is the sign of richness and due to its classy and elegance look it reflects a high status in the society. 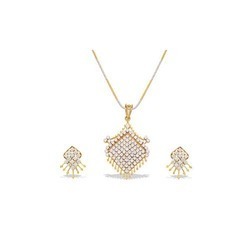 Our pendant sets are exclusive with intricate designs and fine polishing.